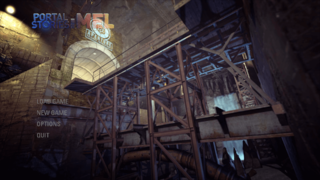 Portal Stories: Mel is a mod for Portal 2, which was officially approved by Valve and is available on Steam. The player takes on the role of Mel (but not that Mel), a test subject in 1950s Aperture who wakes up far in the future after a failed Relaxation Vault experiment. A dark gray door handle. It seems like this would appear in the early Old Aperture portions of the game, as it wouldn't really fit anywhere else. 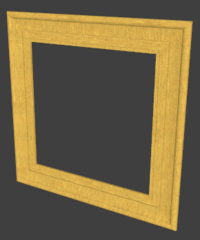 A wood poster frame with a somewhat simple texture. These also look like something for Old Aperture. Despite the name, none of the game's posters really fit inside of this. A 64x64 unit version of the above model. The inner rotating part of a revolving door. This doesn't have correct collisions - concave mode is not enabled, causing the collisions to be "shrink-wrapped". It also has some texture layering issues with the glass, and a somewhat low resolution texture. 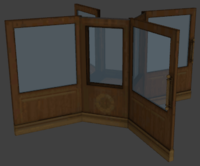 The outer part of previously mentioned revolving door. This also has incorrect collisions. Text can be seen on the model which reads "Reception" and "Exit". 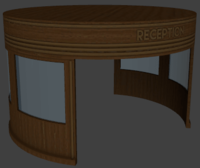 No revolving doors appear in the game, although there are several places where this model would fit, such as the lobby entrance in Mel Intro. A wall decoration of some sort. 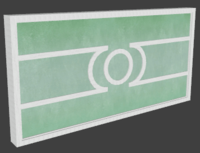 Another wall decoration, in a vertical orientation. A 64x32 unit window. While several larger windows and a thinner window of the same size are used, this one isn't. The larger windows are known as window3 and window4; window1 and window2 don't exist. The destroyed version of the big Aperture logo from Mel Intro, as seen in the outro cutscene. This is a pre-rendered video, so the actual model goes unused. A combined version of the Old Aperture relaxation vault bed model. The final game uses separate models for the different parts of the bed. A model for a goat NPC. 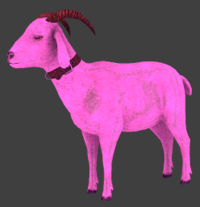 While a goat does appear in the game a few times as an easter egg, it uses a different model with a black texture and no animations. 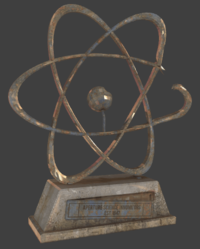 This version is textured, but it appears with a purple tint as several of the textures used are missing. The animations depict it being picked up, carried, and thrown around by...something, although some of them don't work properly. Two of the models used for the tram at the start of the game, tm_stuka_tram.mdl and tm_stuka_tram_doors.mdl, have a second skin which is never used. The texture is simpler and differently colored, there's no 2056 and the Aperture logo is in a different spot. The server models also have a second skin, which (partially) removes the AEGIS logo, "AEGIS Memory Bank" text, and some of the wear around the edge. Check if this is used. The AEGIS servers have a white texture, which is colored by the game. However, this functionality is never used, as all servers in the game are set to the same blue color. Developer Anna explained in a Steam discussion that they "experimented with different colors, but found that only having one color improved the gameplay." In the final map of the game, sp_a4_finale, the player is required to fling on top of AEGIS and interact with a hatch, triggering the ending cutscene. The func_button entity which detects the player's interaction is named press_e_to_hire_us_valve. The actual entity is invisible, and this can never be seen in-game without the use of the developer console. An unused variation of Mel's Story. The map referenced in the filename, sp_a4_factory, does contain a hidden radio. However, it plays a Want You Gone guitar cover instead of this. An unused track. It is seemingly complete, has a soundscript, and even appears in the soundtrack. However, it's nowhere to be found in the game itself. Judging by the name, this was likely used in an early version of the AEGIS boss fight. Additionally, the tracks are named room1, room2, and room2_serious. The AEGIS boss fight contains two rooms, the second of which is divided into two parts. A short track similar to the one played when all of AEGIS' servers are destroyed. This unused sound was likely meant to serve the same purpose in an earlier version of the game. Duplicate copies of the title screen music for Act 1 (Interfacing) and Act 5 (Time and Time Again) exist in the main music folder. The used copies are in the mainmenu subfolder. sp_a1_garden_jukebox01.wav and still_alive_guitar_cover.wav have soundscript entries. However, they are not used by the entities that play the music, which instead reference the WAVs directly. The turrets that appear in the Old Aperture portions of the game actually have voice lines! However, turrets cannot be changed from their default voices without replacing them entirely. Thus, these lines go unused. 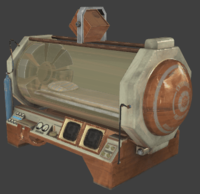 They can be re-enabled with modifications to the game files, but the turrets in the official Old Aperture maps will not use them. They can be heard by placing an old turret in a custom map, or from modern turrets (because they replace the default lines, as stated previously). virgil_36.wav "Good, you got around that. There should be an override switch on the wall. If you pull it, it will open the door!" This line isn't technically unused, but it only triggers if you wait around for 30 seconds in the room with the switch after you fling past the turrets in Past Power. Since most players would just flip the switch immediately, it's unlikely that this line would ever actually be heard. virgil_41.wav "So, there’s two ways out of that room. Both are on catwalks up near the top of the room. Consider yourself lucky; they seem to still be intact...mostly, unlike everything else down in this pit. There’s a connecting bridge to the next testing tack over there." Placed with the lines in Past Power, but it doesn't match any room in that map, suggesting there was an area in the map which was removed. The English subtitles add "Go through there" after "pit". virgil_109.wav "Excellent! I knew you could do it! The door should just open by itself now." The logic_choreographed_scene entity that plays this line is present in Concepts. It's never triggered, however, rendering it unused. The line is fitting for this chamber, as Virgil comments on Mel’s inability to open doors at the start of the test. virgil_113.wav "Oh, look! You can get out through there! There's a door to another testing track." Also present in Concepts but never triggered. The second puzzle (where the entity is positioned) does have a door to another testing track, which AEGIS moves out of the player's reach. virgil_139.wav "Gaah, he’s onto you again. Keep moving!" The entity for this line is present in Transition. It's set to trigger after AEGIS' "target reacquired, scanning recommencing" line - except that that line isn't set to trigger, causing both to go unused. virgil_179.wav "Just down there should be your way out." Placed between the lines for TB Over Goo and Two of a Kind. Neither map references it, and there's no place it would really fit there. virgil_184.wav "We’re getting closer and closer to the production facilities. AEGIS is secured behind a whole series of safety protocols, one of them being a custom turret production facility. It makes new turrets all the time to make sure that his defense is as up to date as possible." The entity for this line is present in Destroyed but never triggered. Of note is that this chamber has no entrance lines. virgil_185.wav "Looks like AEGIS is still pumping up the toxic goo out of the salt mines. It’s flooded the lower chambers and is rising fast. We don’t have much time. We’ve got to stop it." Set to trigger after the previous line. virgil_186.wav "Nice, the compile finished. Let’s see... this is the final working test chamber. The next one is broken, but it should give us an opportunity to get to AEGIS. We might need to go through a cube production facility first though." Set to trigger after the previous line, with a slight delay. “Ah! There, try that.” This line doesn’t actually exist in the files, as it would have been included in the ending movie’s audio had it not been removed. However, the subtitles can still be found. Likely referring to the 2056 sticky note. audio 11_bip.wav “Intrusion alert in Aperture Employee Guardian and Intrusion System. Threat level of unknown mechanical infiltration No. 1: Maximum” Placed right before “activating AEGIS firewall”. It was probably meant to be used there, although it isn’t referenced in any maps. audio 18_bip.wav "Target reacquired, scanning recommencing." The entity for this line is present in Transition but never triggered. audio 26_bip.wav “Biological scan initiated. Seeking one organic target at threat level 100%.” Placed right before “tracking on target failed, heavy organic interference”. It was probably meant to be used there, although it isn't referenced in any maps. audio 41_bip.wav “Server capacity degrading. 50% online.” Various lines intended for the AEGIS boss fight. countdown_7m.wav “Lethal oxygen concentration in t-minus 7 minutes.” Additional countdown lines for the AEGIS boss fight. The countdown timer in the final starts at four minutes in Advanced Mode, and six in Story Mode, but never eight. This page was last modified on 21 March 2019, at 14:00.